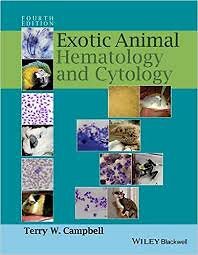 Exotic Animal Hematology and Cytology, Fourth Editionupdates the most comprehensive reference available on exotic animalhematology and cytology of all major species. Abundantlyillustrated throughout, the book acts as both an atlas and a text,offering high-quality photographs and step-by-step descriptions oftechniques associated with preparing and interpreting hematologyand cytology samples. In addition to thorough updatesthroughout, the Fourth Edition offers a logical reorganization intoa more user-friendly disease-based chapter structure and addssizing bars to the images for comparison. The book provides concise, practical information on hematology andcytology of small exotic mammals, birds, reptiles, amphibians, andfish. Exotic Animal Hematology and Cytology is anessential resource for veterinarians and veterinary technicians inclinical practice, clinical pathologists, laboratory technicians,veterinary students, and those engaged in avian and exoticresearch.